Help me solve this mystery! Am I seeing it correctly the seat tube has a Super Vitus decal and the downtube has a Columbus decal? Yes, that is correct and a Campy decal on the top tube - bizarro! Are the seatstay caps embossed with a name? 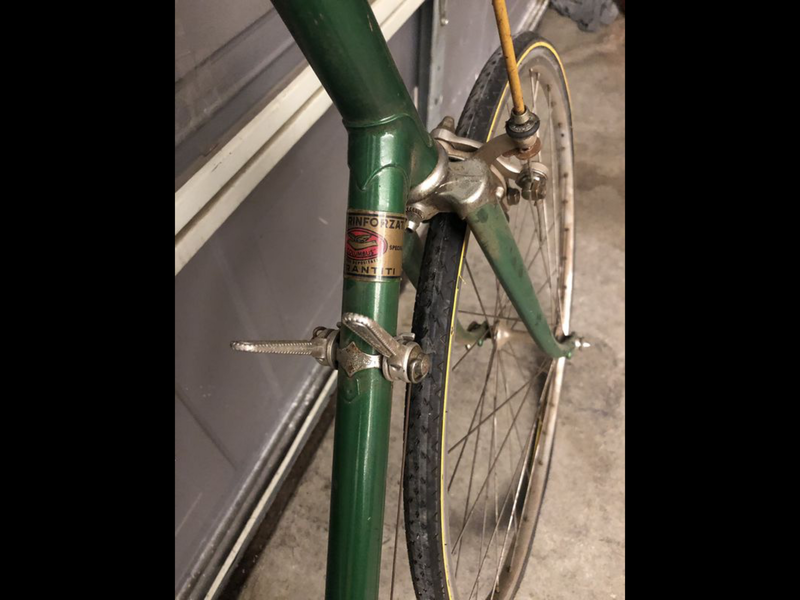 What is the seatpost diameter? 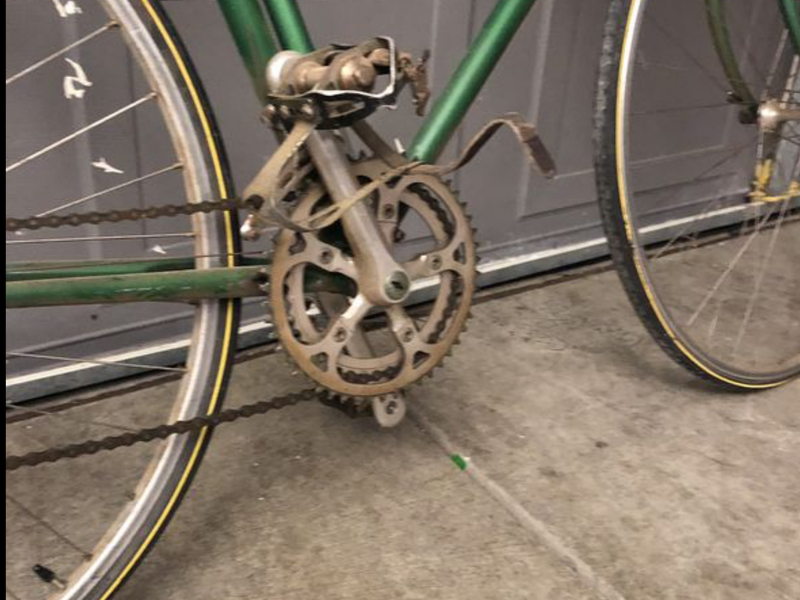 Am I correct in thinking the only braze-on is the cable stop on the chainstay? I am with Aubergine on this one - what is the seatpost diameter? For that matter, is the seat tube exterior 28.6 or the metric 28 mm? Is the bottom bracket French or English threaded? The seat stay caps look like they're swaged, like a lot of French bikes. The stamped dropouts look to my eye like the Nervex units many French makers used. 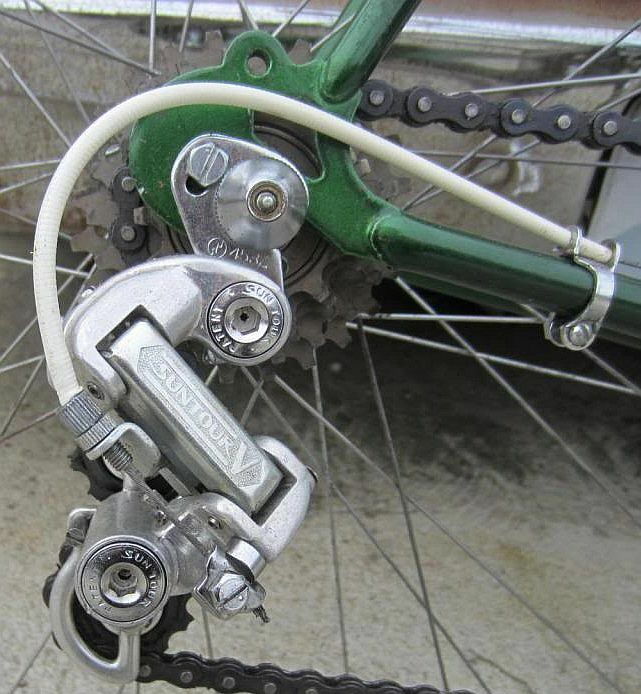 The stamped dropouts and generous clearances do not automatically make this a low-end bike - lots of good to high quality bikes were sold without derailleur-threaded dropouts, especially when Campagnolo, Simplex and Huret all offered competing and non-interchangeable systems. Those look like tapering seat stays, too. 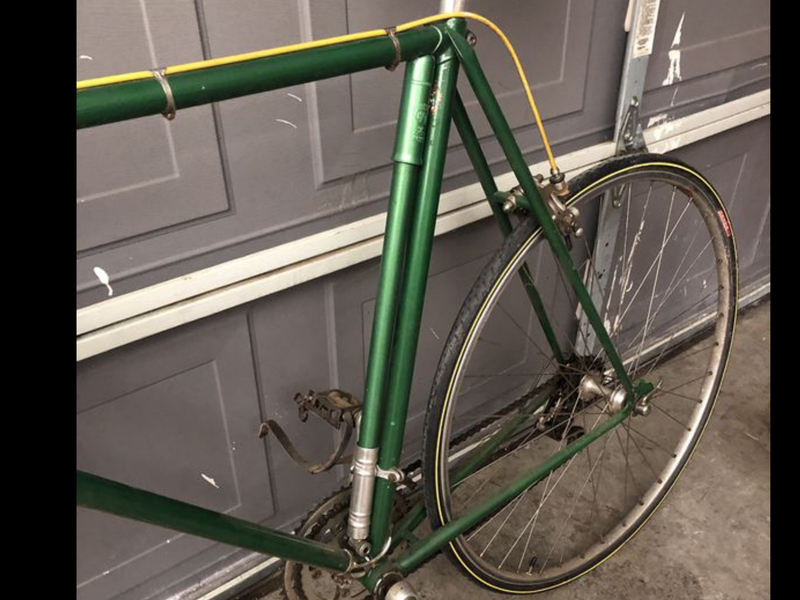 Interesting looking bike, and the seatpost information might yield some clues. No stamped name on the seat stays nor any serial number or other info stamped on the bottom bracket. The seat post was French (not Simplex) but can’t remember the actual name. No other braze-ons outside of the cablestay for the derailleur. Concur that the frame is most likely French. Won’t be able to tear down the bike further until late May due to travel and work sked. Would measure the seat tube diameter and tell you but traveling right now. Clearly the frame is a repaint - dark metallic green that should look nice when cleaned up. Have attached a few more photos that I have on file. Thx to everyone for comments and ideas so far. Chainstay stop puzzling. 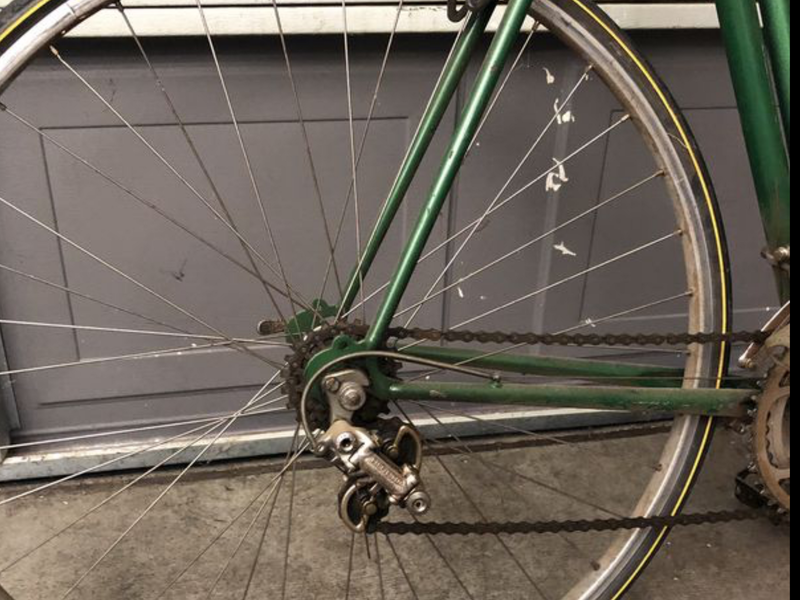 Appears to be a Campag 621 (or copy thereof), which is something not usually encountered on a French frame with stamped ends. 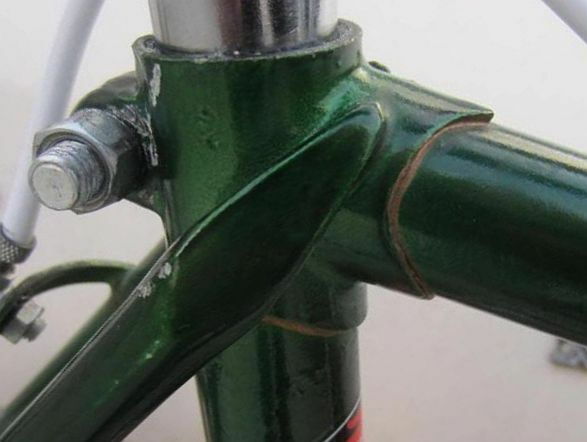 There is a second braze-on (actually a staked-on) in the form of the pentagonal no-slide pibb on the downtube. Is saddle pillar JPR (Routen)? Adjustable bottom bracket cup has the two flats of RGF, REWAX and Bardon pattern adjustables. Suggestive of a metric threaded shell. Machine may have come with cottered set and fitter of present chainset reused cups. Has anyone seen a European fork crown like this one? Wondering if fork original. Disassembly of headset shall afford view of steerer. If fork of French origin one might expect to find it marked NERVOR. If of Nippon origin we might see a name such as Tange. Combination of lugs, seat stay treatment, shape of domed stay ends and pattern of no-slide pibb is consistent with a Gitane product. (Not asserting an ID.) Is shell Gargatte (may be marked RGF beneath paint)? Chainstay stop would be a clinker for a Nantes origin. Of course since frame has received respray it could have been an addition or replacement. Dropouts appear they may be NERVEX nr. 1004. Juvela, yes, I recall seeing the RGF stamp on the BB shell. Good spot! I thought it might have been the frame builder but a Gargatte shell is probably right. I also remember that it came with an Avocet seat pillar although I don’t remember if it was 27.2 or 26.8. I wonder if the fork crown is consistent with a Nervex (?) 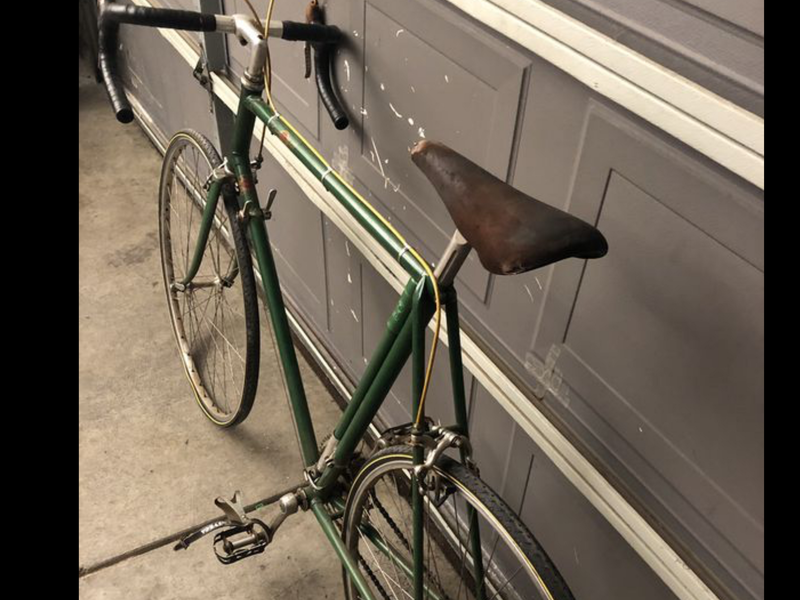 possibly on a Mercier? Great feedback from everyone - I appreciate it. Pillar size somewhat puzzling for a frame with stamped ends from this era. Avocet pillar is rebadged OFMEGA. 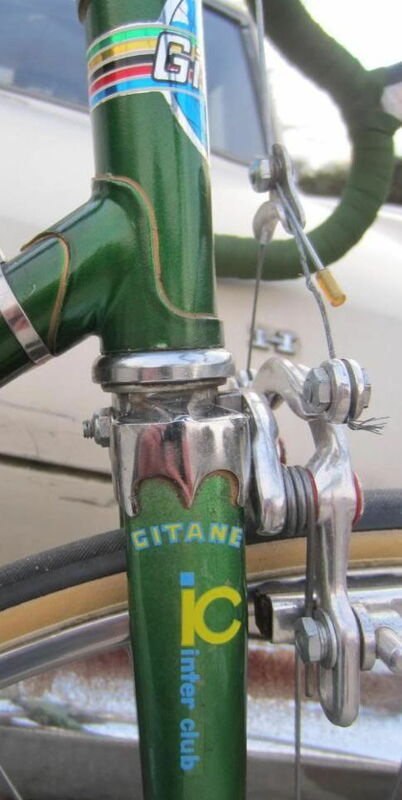 Could it be some variant of a Gitane Route de France (model 112), built of Gitane's mysterious Flash Z tubing? I have a memory of reading somewhere that Flash Z (or Z Flash, the decal isn't clear) might have been some sort B-grade Reynolds tubing ... if French, wouldn't the seat post be more likely to be 26.4 or 26.6 mm? 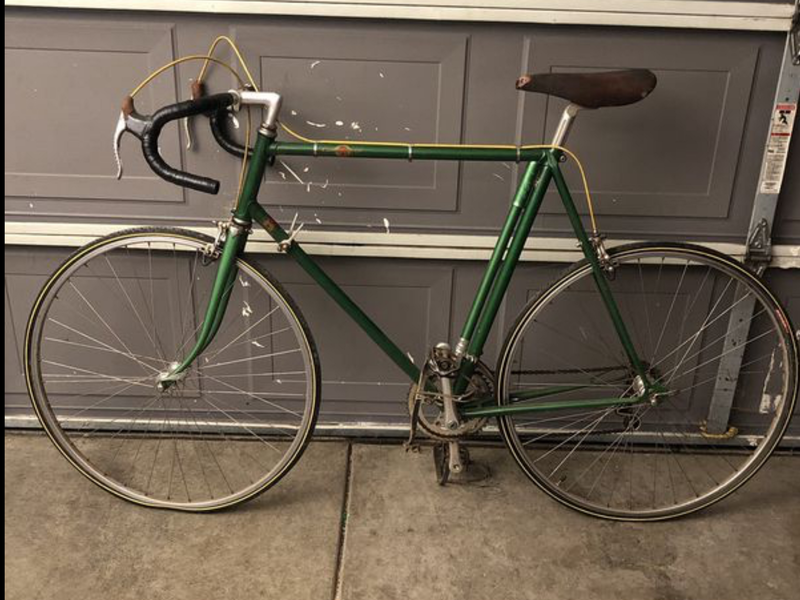 I have a bike with Flash tubing, it has a seatpost smaller, I think it's 25.4 size. Looking at the seat stay tops, the Bocama lugs and the stamped steel dropouts my guess is the frame in an early 70's Gitane Interclub. That was Gitane's amateur racing model from the late 60's to the mid 70's. The fork has been replaced. 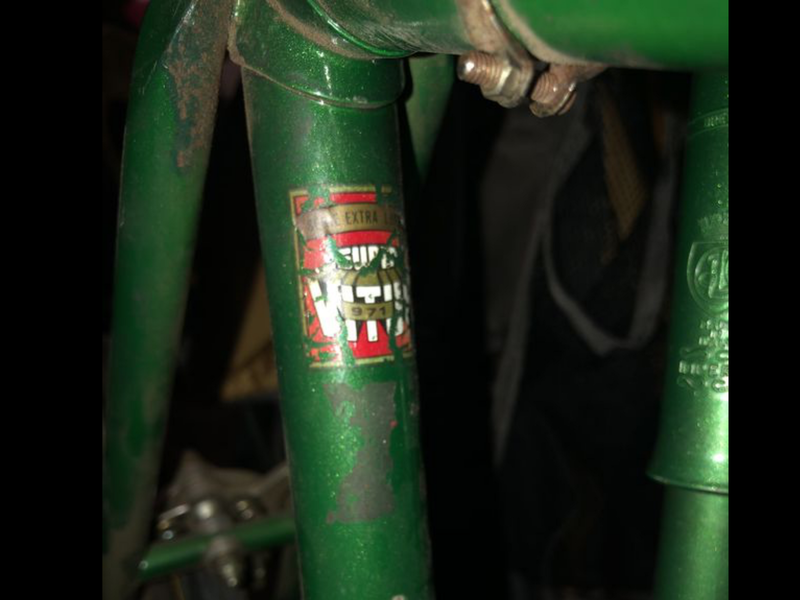 Judging from the stamped steel crown it's Japanese, maybe from a Nishiki or it's a Tange replacement. Check the steerer diameter - 1" or 25mm. Tange made replacement forks with 25mm x 1mm French threads too. We sold Gitanes. I've owned a number of Interclubs, BITD used them for trainers/beaters. Some had frames made of standard Gitane gaspipe tubing. A few were made with lighter tubing and even fewer were made with Durifort tubing. Standard Gitanes like the Gran Sport plus most Interclubs used 25.8mm seatposts not 25mm or 25.4mm as on Peugeot U-08s. The Durifort frames used a 26.2mm seatpost. As @juvela mentioned, the seat tube could have been reamed out. 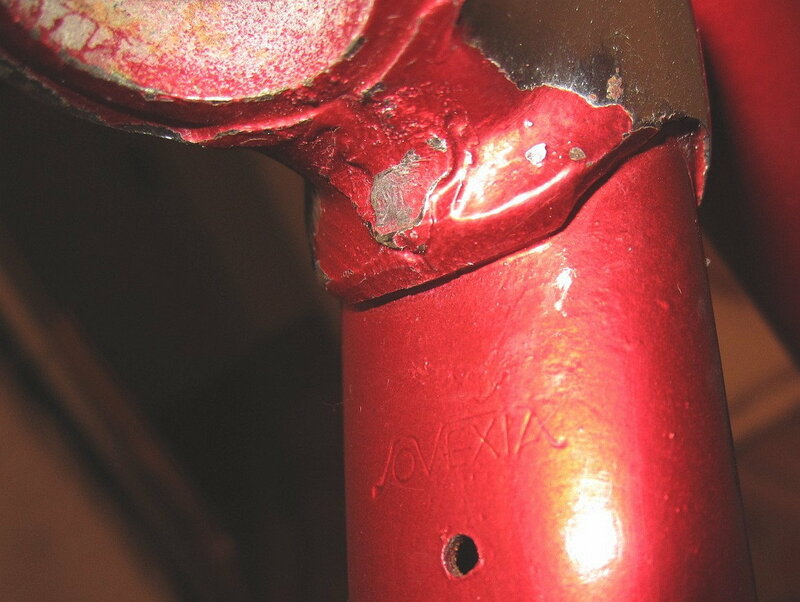 The "diver bell" cable stop on the chain stay was probably brazed on when the bike was repainted. It's a respray and someone got happy with decals that are red herrings. The components are a real mishmash so they are no help in identifying the bike either. It's one of those "just ride the bloody beast" kind of bikes. Here's a mint condition early 70's Interclub from a 2013 BF discussion. Fork crown on this bike is a Nervex and it's different from the one on the OPs bike. Last edited by verktyg; 04-17-19 at 04:26 AM. Chas beat me to it. I would have guessed Interclub as well. Assembled and worked on a lot of Gitanes BITD. A few years ago I picked up this shop worn but NOS Interclub frame. I estimate that it was made in the late 60's. 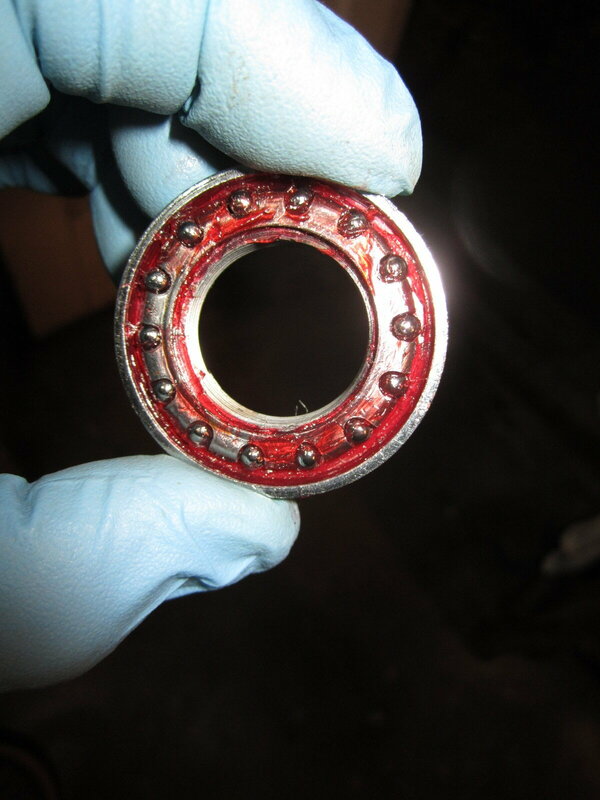 The red grease that Gitane used in the headset was still good! The tubing was stamped "SOVEXIA" which I've never heard of. I got it to build a SS but the frame turned out to be too big for me to safely ride so I swapped for some goodies at a LBS. thanks so much for all of your outstanding information! have had a fork made of this tubing in me shop for over forty years. had never been able to learn anything of it. so when i jointed Tonton one of the first things i did was to look it up. Tonton search engine says it has never been mentioned. must be rare as heck if not mentioned there! 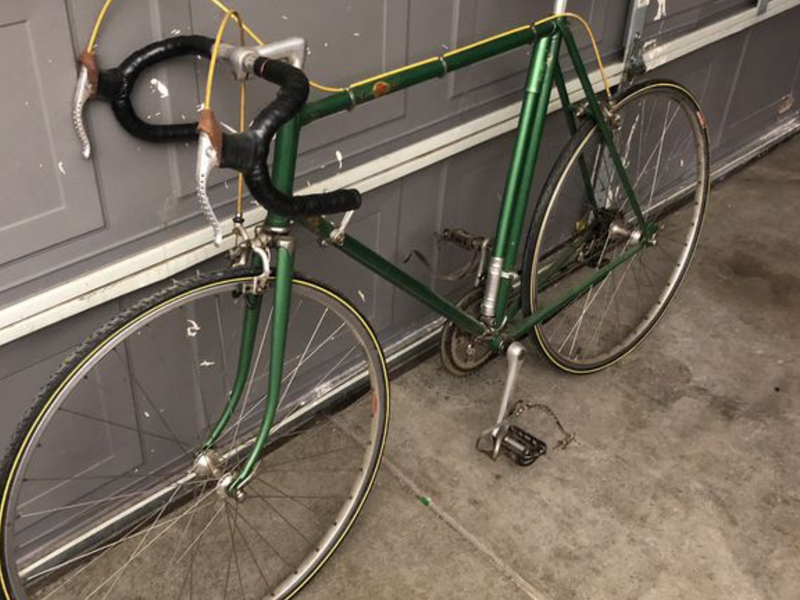 I've seen that type forkcrown on some Miyatas, agreed with our experts it's a JP replacement fork on an Interclub frame: excellent sleuthing, gents! Nice job everyone with the feedback. When I return to the bike, I’ll take the appropriate measurements and post them. Suspected a French bike but not an Interclub. The fork certainly gives a head fake. If truly an Interclub, scratching my head why someone would load it up with Campy Record parts including SR brake levers. Of course, the various decals are strange as well. 🤪 The world is full of strange things. Will also give it a test ride and report back. Great job detectives - I appreciate it! Upgrading a rather pedestrian model quite common BITD. An enthusiast would begin with whatever frame they had to hand and keep upgrading its fittings as they could find/afford them. The idea being to eventually get it up to their "dream bike" insofar as kitting whereupon they would keep an eye out for their "dream frameset" on which to mount the assembled "dream" fittings. I built up several Interclubs with Campy wheels, Stronglight 93 cranks, side pull brakes and so on to use as trainers and commuting bikes. I gave (no sold - every one pays) one of them to my GF (she was making more money than me at the time). At our shop, the philosophy was: the frame and wheels were the most important parts on a bike. Our goal was to promote cycling rather than cash in on the bike boom "10 speed racing bike" fad. 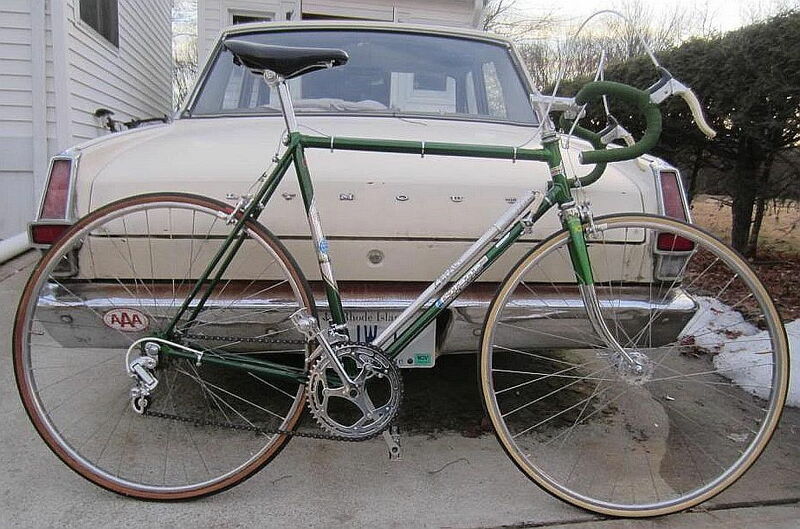 After the boom ended in 1974, entry level bikes were less than 50% of our business. The $200-$300 (1970 $$$) range was the sweet spot for us. We fixed up anyone who seemed to have an interest in cycling with a nice riding bike with alloy clinchers and many times an economy set of sewup wheels for weekend rides. We sold folks bikes they could afford with the idea that they could upgrade the vanity items like derailleurs, cranks, and other better quality components as they went along. Eventually many of those customers came back and bought better quality bikes from us. We catered to commuters and tourists. While we sold more top level components than all of the other shops in the area combined, we didn't do much business with the racer set - they never had any money! Legnano/Frejus bikes were a good example. 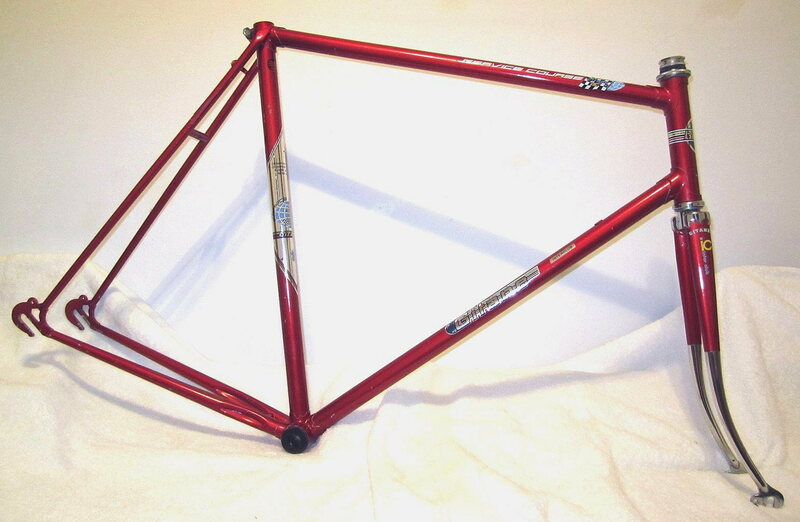 The ones we stocked all came with Reynolds 531 or Falck tubing frames. The same frames were available with components ranging from cottered steel cranks all the way up to full Campy. After 1974 there was a declining number of European made bikes coming into the US market. Gitane was going south fast; Peugeot, Raleigh and Motobecane were the remaining players. We started importing Andre Bertin bikes in 1975. In our first order many were bog standard off the shelf entry level models, but there was a mix of the better models too. In 1976 we started specifying Durifort forks and stays on the low priced bikes and all Durifort on 2-3 of the next models up. 25-26 Lb. bikes with clinchers, 23 lbs with sewups. Most Japanese bikes no matter how well equipped and how good the cosmetics, were still clunkers until after about 1976. We didn't sell any Japanese bikes for a number of reasons. There was a market for French bikes in our town - Albuquerque, NM. Gitane, Bertin, Peugeot and Motobecane did well. 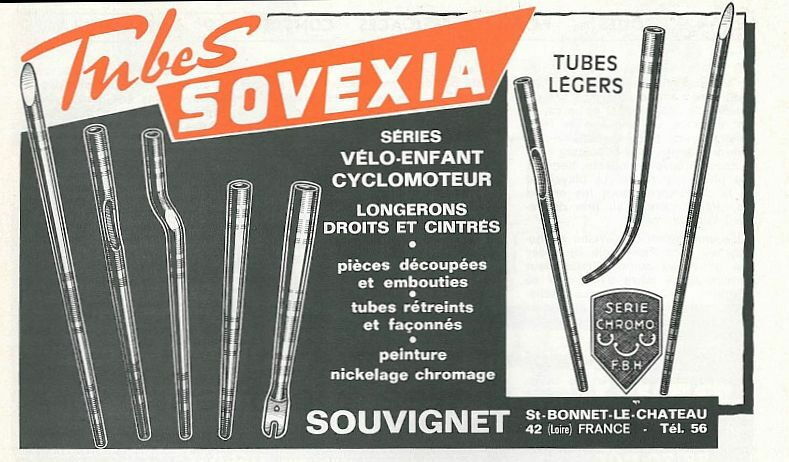 SOVEXIA, I ran across this ad from 1971 on a French forum last night. Apparently they specialized in forks and stays made of chrome-moly steel?? plus tubing for mopeds, folding bikes and kids bikes. You must have worked with Richard C. Hallett. Can still recall some of his great mail-order specials. Thanks so much for the Sovexia information - yet another mystery squared away.